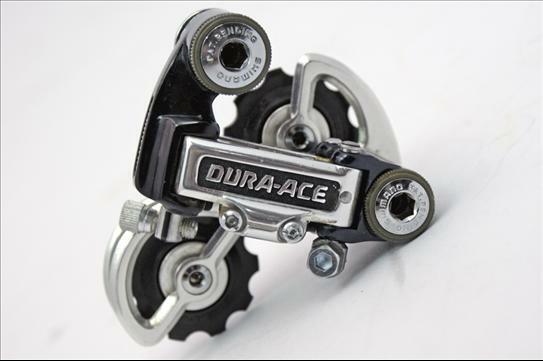 Black anodized version of the first generation Dura-Ace labeled rear derailleur. I don't see the markings on the back arm stating that it was known as the RD-7200 when this one was produced, but this design was known as the 7100 by the early 1980's. Note, this example seen here sold for over $80 in Feb. of 2010. Guide pulley made of plastic, instead of the 7200 model which had stainless steel upper pulley, and 7100 has shorter cage than 7200 as well . There was also available in silver.